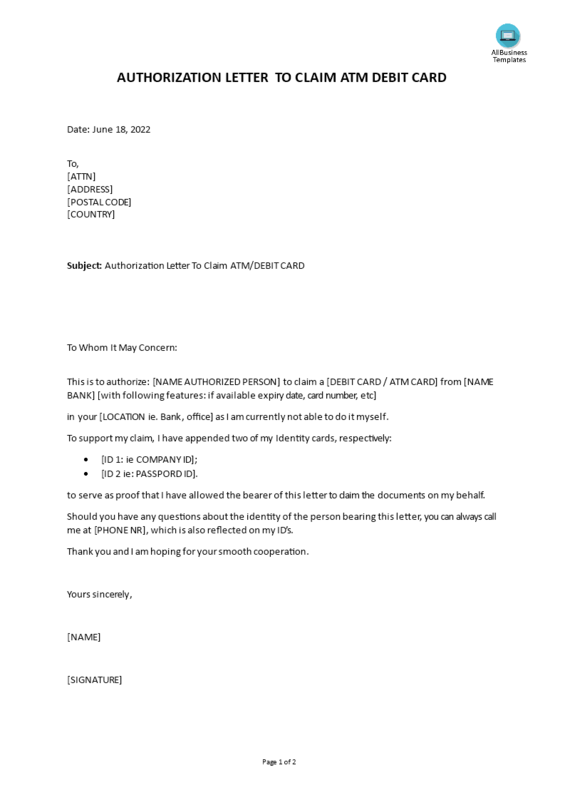 This Authorization letter sample is made to act on behalf to collect an ATM Card. It is a useful letter template that enables you to draft a personalized version of your own very quickly. Especially if you will not be able to pick up the ATM Debit Card by yourself. It can also be used to ask for permission to carry out certain responsibilities, or to inform another person that you will be replaced by someone else so, to do your work on your behalf. Writing an authorization letter to pick up an ATM Card has to be very specific and detailed because it's a sensible item. Save yourself time and efforts and download this Authorization Letter to Claim ATM Card on somebody else's behalf now!